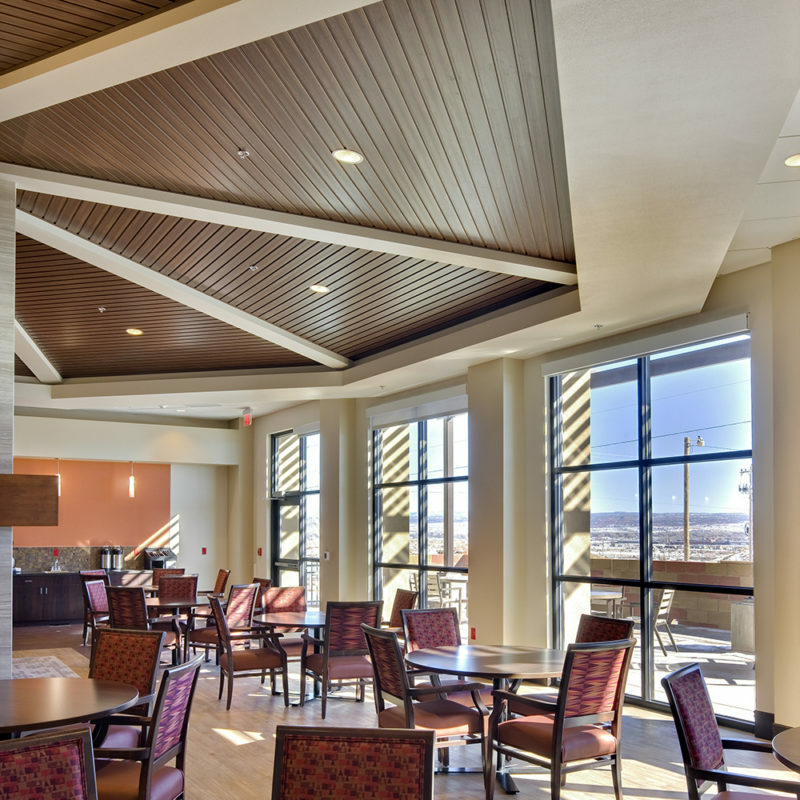 Architectural design for senior living and nursing home facilities has had to continuously adapt over the years to promote a high quality standard of living and to provide for dignified care for an aging population group. 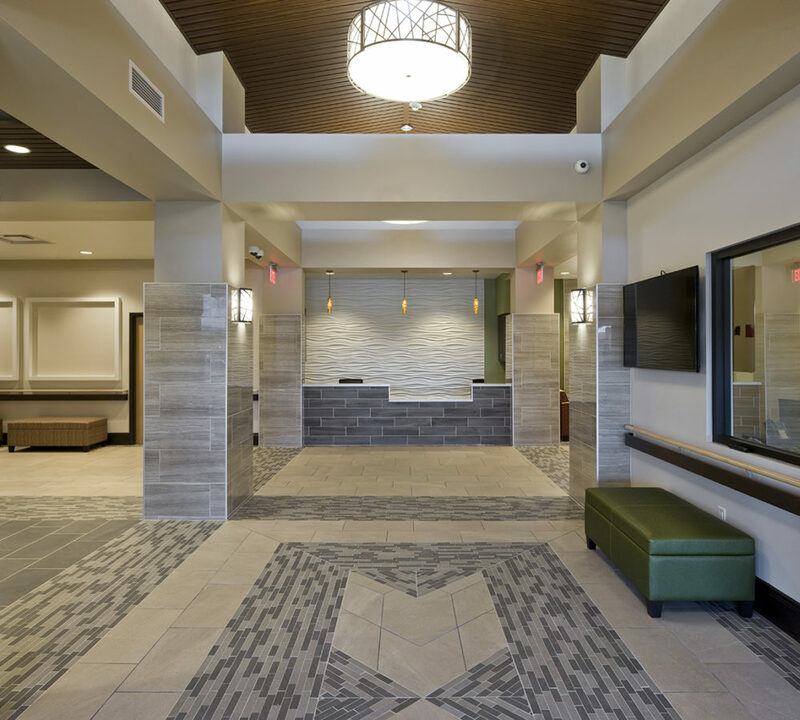 The design for the Chinle Nursing Home was inspired by a household design model where a smaller group of private patient rooms surround large common areas with direct access to a home-like kitchen, living room with a fireplace, and family-style dining room. 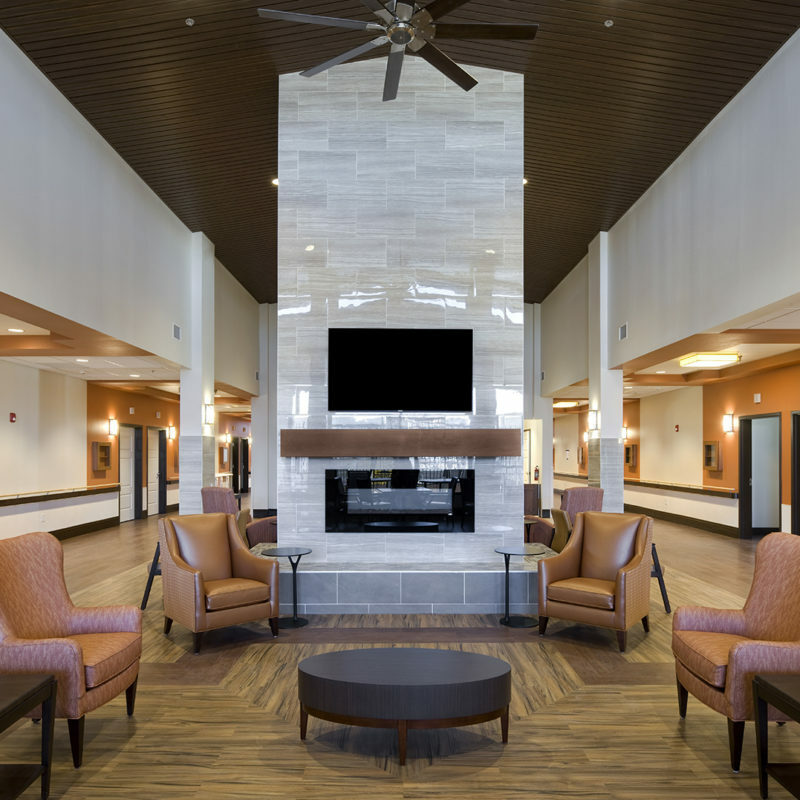 This design style removes all notions of an overly sterile or institutional setting and replaces it with a warm, home-like environment, which allows residents to feel more comfortable while receiving care. 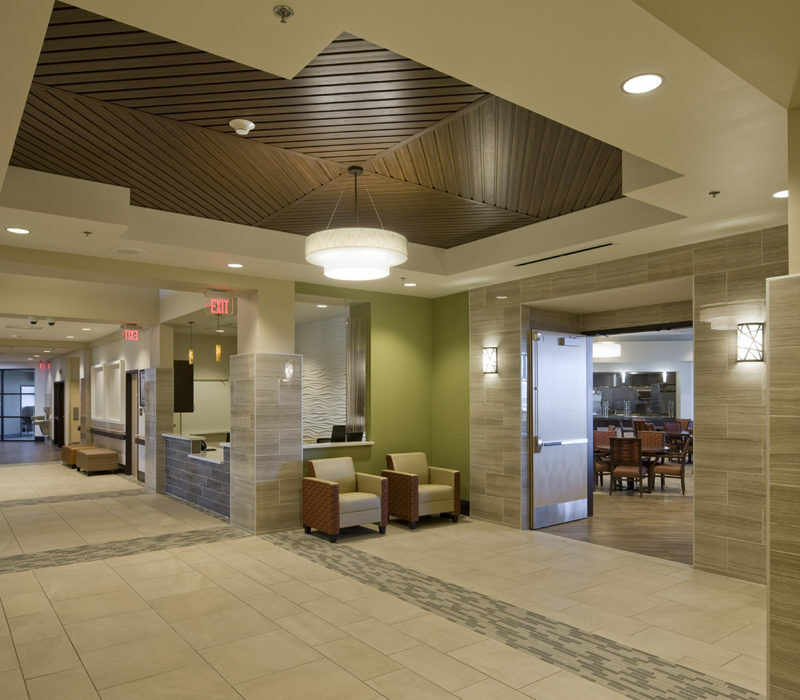 Aligned with the implemented household design model, the following design trends were purposefully integrated into the Nursing Home. The design of the building incorporates a number of public and communal areas that encourage interaction between residents, staff, and visitors. 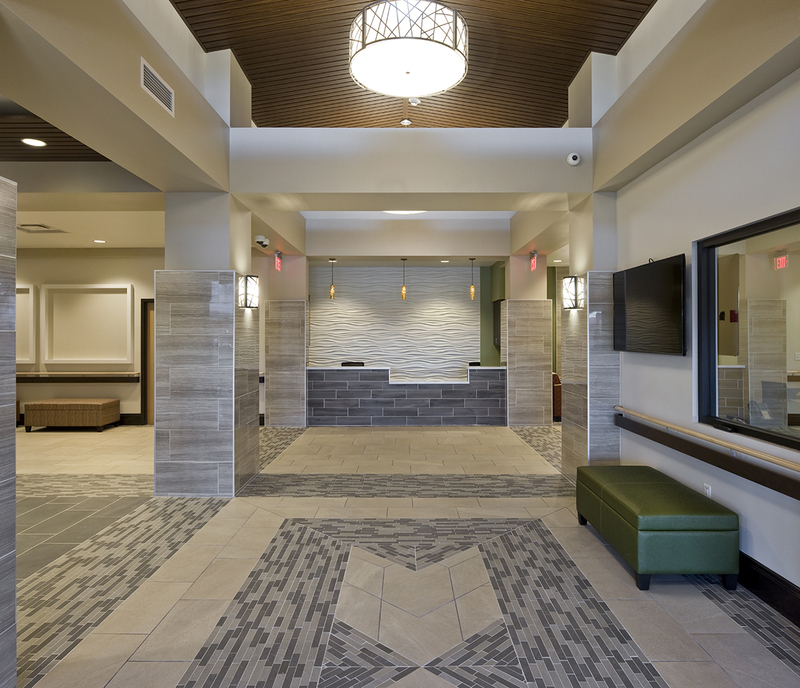 The main lobby provides a home-like entry with its pitched ceiling and chandeliers, as well as the traditional Navajo rug floor tile pattern. 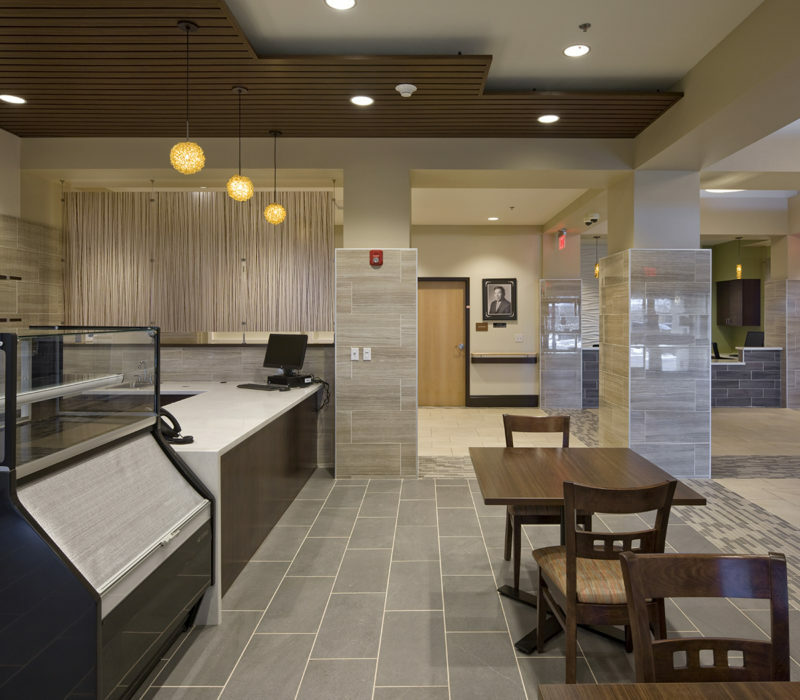 The café located near the lobby furnishes a soft, cozy space perfect for visits with family and friends and the seating nook near the dining room provides additional space for similar visits. Certain nursing home layouts can be disorienting and stressful for patients who deal with cognitive impairment. A variety of design methods were implemented throughout the Chinle Nursing Home to help residents who struggle with this impairment. The use of vibrant color as a visual cue has been proven to help with memory recall. 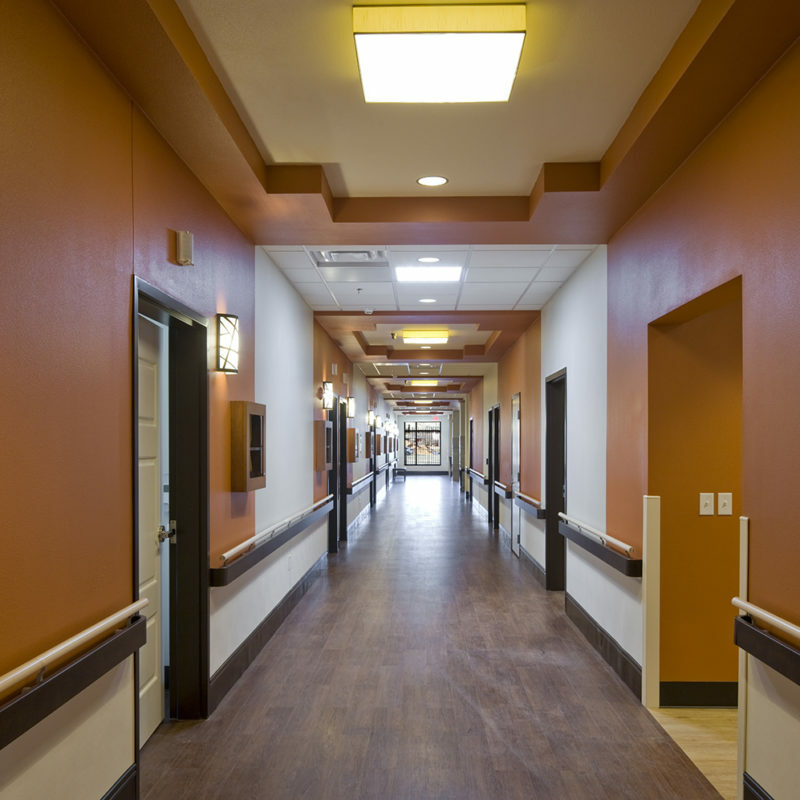 Each household residence “wing” within the Nursing Home, though mirrored in plan, can be easily identified with its own individual color scheme to help residents orient themselves. Specially designed memory boxes, located outside of each bedroom, are intended for residents to place inside a personal item such as a photo or small memento, giving each resident a sense of personal space and belonging which aids in finding their room. Biophilic Design Principles enhance the human relationship with nature, and when properly incorporated into a facility design, can drastically reduce stress, increase productivity, promote well-being, and provide an overall sense of home-like comfort for facility users. 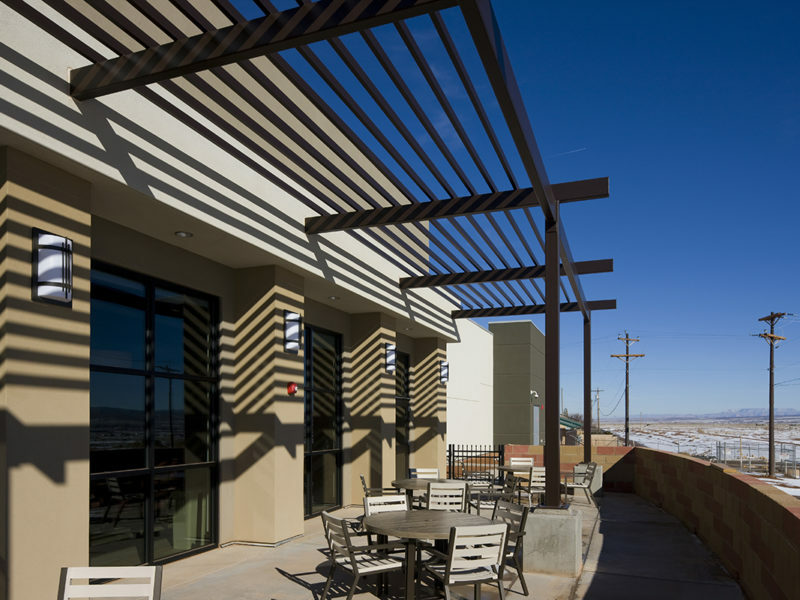 To achieve this for the Chinle Nursing Home residents and staff members, large windows were included throughout the facility and were placed within each resident living room, providing an abundance of daylight and grand views to the surrounding landscape. Natural elements provide a calming atmosphere and are referenced in the design with finishes such as the wood-look ceiling and the floor and wall tiles that resemble natural stone. Designing for the caregiver is equally as important. 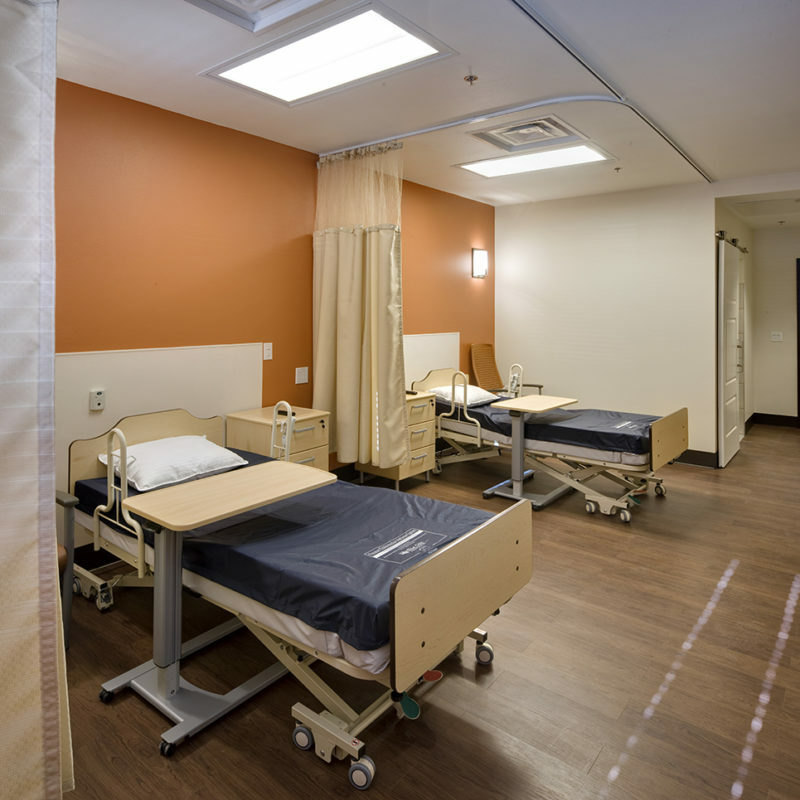 Providing the nursing staff with adequate space and equipment as well as secure areas which are off limits to residents, help caregivers take care of the residents most effectively and with ease. 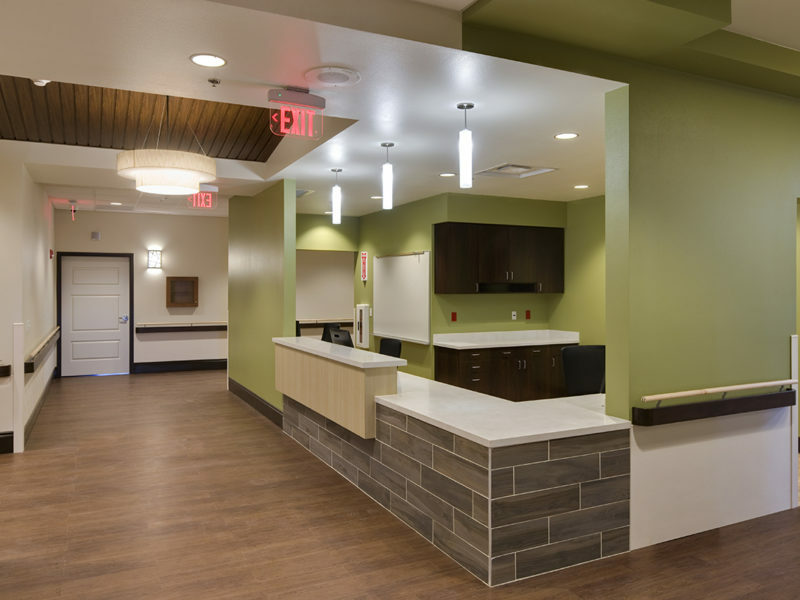 The Chinle Nursing Home distinguishes nurse-care work rooms, charting stations, secured storage and support rooms, and a private staff break rooms with specific colors and visual cues. It is important to provide appropriate security measures without creating an overly clinical and restrictive environment for residents and staff members. Studies have shown that when patients have the freedom to choose between a variety of safe and secure surroundings, a sense of purpose and independence becomes encouraged. The layout of the Chinle Nursing Home allows the residents to walk unobstructed from one end of the facility household to the other. Additionally, each household has its own large covered porch and enclosed garden space where residents can go outside for fresh air and to avoid feelings of confinement.